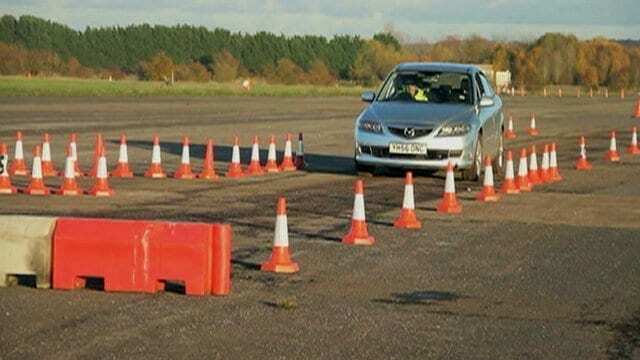 A British company has demonstrated a prototype device capable of stopping cars and other vehicles using a blast of electromagnetic waves. The RF Safe-Stop uses radio frequency pulses to “confuse” a vehicle’s electronic systems, cutting its engine. E2V is one of several companies trying to bring such a product to market. It said it believed the primary use would be as a non-lethal weapon for the military to defend sensitive locations from vehicles refusing to stop. There has also been police interest. The BBC was given a demonstration of the device at Throckmorton Airfield, in Worcestershire. Deputy Chief Constable Andy Holt, of the Association of Chief Police Officers (Acpo), who has evaluated the tech, said the machine had “potential, but it’s very early days yet”. At one end of a disused runway, E2V assembled a varied collection of second-hand cars and motorbikes in order to test the prototype against a range of vehicles. In demonstrations seen by the BBC a car drove towards the device at about 15mph (24km/h). As the vehicle entered the range of the RF Safe-stop, its dashboard warning lights and dials behaved erratically, the engine stopped and the car rolled gently to a halt. Digital audio and video recording devices in the vehicle were also affected. “It’s a small radar transmitter,” said Andy Wood, product manager for the machine. He did not provide other specifics. However, the Engineer magazine has reported the device uses L- and S-band radio frequencies, and works at a range of up to 50m (164ft). Some experts the BBC has spoken with suggested that turning off the engine in this manner would not stop vehicles rapidly enough. Others worried about what effect it might have on a car’s electronic brake and steering systems. But E2V said the risks were lower than with alternative systems. Acpo suggested the machine’s ability to stop motorbikes “safely” could prove particularly useful. December 3, 2013 - New product shuts car engines off with a radio pulse Ars TechnicaThe company E2V has developed a prototype device that uses a radio-frequency pulse to shut down a car's engine at range, according to a report from the BBC. April 14, 2019 - Police turn to technology to solve pursuit problems NewsroomPolice are starting research on how technology can help reduce harm in police chases. March 27, 2019 - Review: The Punishing Sekiro: Shadows Die Twice Coasts on Borrowed Moves slantmagazineIts boss fights highlight the contrived lengths that FromSoftware has gone to in order to satisfy players' thirst for difficulty. April 3, 2019 - 2019 Volvo XC40 Ownership Review Kelley Blue BookWe're spending 12 months with this Volvo XC40, which wins two KBB Best Buy Awards for 2019, reviewing the full ownership experience with ongoing updates. October 15, 2018 - 60,000 without power as PG&E shuts down lines over wildfire fears San Francisco ChronicleTens of thousands of people in 12 counties braced for power failures in the Bay Area and Sierra foothills Sunday night after Pacific Gas and Electric Co.